Hi-Nice outfits-but it is okay to be colourful and or stylish! - as long as your covered and its not tight, so colourful and stylish is good :) theres no rule against it i don't think! Great idea of a post..!! I think when living in a European country its ok to embrace a bit of color.. as long as the main rules are respected (tighness and covering) why not add a pop of color? Unfortunately so many young women today disprespect the Hijabs etc.. (like anonamous said) by slapping on make-up. I was in Harrods last summer and a woman got her Burqa stuck in the escalator.. when it ripped off she was dressed so innapropriately underneath I was shocked!! The highlight deffinately being the diamante g-string poking over the top of her low-cut jeans! This post however contains such nice, appropriate looks.. I know a few freinds who would love these looks!! I don't like any of them. No offence. They are to busy, to layered and they don't really flow or even go together. They look bulky and uncomfortable. Thanks Tali.. Wow that harrods story is shocking!! I am so jealous of people who can do layering like that. But yeah, headscarves and natural beauty leaves me in awe. Beautiful striking eyes and ugh, I wish they were mine! I've seen some colorful, trendy attire. It looks sooo good too! i think its very nice of you to do this post for your muslim followers. i think they're very creative and pretty :) i dont wear hijab, but when i do,at least i have some idea of how to style and wear it without looking boring. thanks!! :) you rock!! ignore the haters, they're not worth it! p.s. the other anynymous, if u aint got something nice to say,just shut up. Umm... gstring/ thongs under a burka are not beauty!!!! lol- it defeats the purpose! I don't feel sorry for the woman on the escalator-instead she should have been filmed and put on youtube! I am anonymous post 1 & 2! (forgot to add G) you seem to be getting some off replies! and on other blog posts also. I for one like to read positive comments from other bloggers rather than b@tchy negative ones, so have you thought about just allowing registered users to leave comments (good or bad) and change the settings so that anonymous can't leave any comments (i am registered but have an empty blog) -i know other bloggs that do this. It seems that people tend to verbally abuse behind the computer! and i'm sure if they were registered they would not be such haters! plus it kinda ruins your blog. Keep up your god work girl! such a cute style.. even though I am not a Muslim, I would totally see myself wearing the example 2..
As for make up.. I see it all the time, even today it was very warm outside and there were girls who were wearing a headscarf, had on make up and a MINI SKIRT!!! I was like, OMG seriously? @ anonymous who thought the woman in a Burka should have been filmed and put on youtube? Are you kidding me,that's not nice. Even if she was wearing a g-string and low cut jeans, she was hiding it!! It wasn't meant to be seen by anyone, I feel sorry for her. The Harrods story made me laugh! Bad luck for the lady in question! 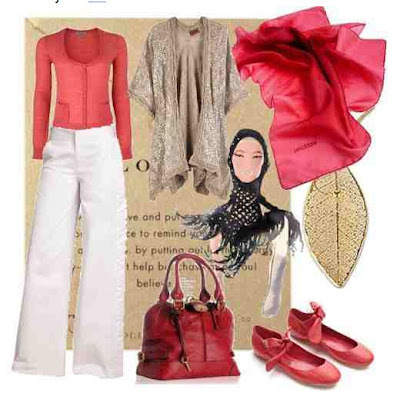 I see many many Hijabis who are so stylish yet dressed respectably, I think it works well! I agree that the makeup should be understated and not too out there, unless for a wedding etc. I've been to Dubai a few times and I am always SHOCKED at the amount on display! The Ladies wear their full Burka's etc then open them up & take their scarves off in the shopping centres because they are away from family. It's called FREEDOM OF SPEECH, i suggest that you google it! I don't wish to be a Muslim, but I respect the ones that are :) Ofcourse I don't know your (Islam)rules and all, but I just thought it was harsh to say that.. I know what freedom of speech is, that's why I went ahead and commented on what you said.. Thank you for the great post, Excellent as usual! SweetestSinSheroon, please ignore that anonymous person. You did NOT deserve to be addressed in such a rude manner! I agree with your earlier comments. :) It doesn't matter what she was wearing underneathe, it wasn't her fault that her covering got caught in the elevator. To the anonymous person with the attitude: Please remember that one day we wil have to answer for every single little thing that we do or say or even type so if you don't have something constructive to say don't say anything at all. p.s. I agree with the first anonymous poster who mentioned that you should only allow registered users permission to post. Hopefully this will eliminate some of the hater trash that pollutes the comments section. @ MG.. Thanks Girl :D I appreciate it.. I really enjoyed this post. Not a muslim myself, u know this u met me .. but i live in quite a large Asian community and love to see how young muslim girls put their outfits together in keeping with their traditional values and beliefs. I know some of them would love this post. I know some girls didn't like the layering aspect but i'm sure some of this is optional and Bubblegarm is just giving an overview of her personal taste and suggestions of what others may also like ... personal style is all about tweeking it to our own preferences. This is a great post, all of them are nice, weather you were to wear a hijab or not. Love the styling. One of my friends prefers to layer like this. I'm not sure if I want to moderate my comments yet, if it gets unbearable then I might.. I want honest opinions and don't mind critisism, it actually helps me improve! I'm not Muslim either, but I really dig the layering too. My fave is the Yellow/Black combination it looks awesome. Thanks crissy :) that's my fav too! VERY NICE of u to think about everyone.am planning to wear higab soon inshallah and honstly i couldnt figure out what to waer especially i live in the USA and what styke should i go for u inspired me of what should i wear thank u so much and plz keep posting more higab styles or from time to time. may allah bless u and grant jannah inshallah. Thanks for your consideration and posting these wonderful ideas. I have a question, where is the dress from in example #1? Very pretty, masAllah. As for the girl in the burka incident--what she wears underneath is her business. It may not be modest, but had the escalator accident (key word) not happened, no one would have ever seen or known. It's her freedom and her take on being comfortable. I know the incident must have been shocking, but she must have been mortified as well. Obviously she felt that type of attire, while comfortable to her, had to be covered by her burka so showing that must have shamed and shocked her as well. I don't think we should judge her for what she chooses to wear beneath her burka. If she is wearing great hijab (burka, cmon thats above and beyond) and not trying to show the attire underneath, she probably shouldn't be judged for that.